Well, maybe not in small part because of this thread, now you see the word NOTIONAL next to the 'millions' of DarwinIA. So why does it seem so far fetched to you that I question the fact that a Spanish guy has $500k in a DARWIN? Why can't I suspect it's notional too? Though I highly doubt perpetrators of constant negativity and false accusations here are going to appreciate our persistent defense of Darwinex with the facts. Hence the idea to poll the community - we do things democratically around here right. We can suspect everything about everyone. That's what you call fact-checking? This thread wouldn't even have been started had Darwinex been open and honest right from the moment DarwinIA 2.0 started in autumn 2015. That's like polling the people at a Trump rally in October 2016, who are you voting for? In this world of trading 99% is fake as you rightly point out in your blog. Maybe you bumped into some true traders invested by true investors. Do you really think half of the investors of JGC are his family? Darwinia is a mean to attract traders and it is working THIS matters. FYI - Thread relocated to appropriate category. Do you really think half of the investors of JGC are his family?So 200 members? What can be defined "finished" in this real world? The same can be stated also about "honest" concept. Writing that my car makes 25km with one liter while you cannot make more than 20 is honest? and IMO is a neccessary evil to grow. 1) A DARWIN is only prone to such behaviour if the underlying strategy experiences a dramatic shift in risk stability, not a Darwinex fault. 2) If JGC attracted 500,000+ in capital, its because investors trust his Darwin's competence. 3) If your accusation holds true, and let's say JGC put his own 500,000 into his Darwin, then it is he who trusts his Darwin's competence. In both (2) and (3), it reflects very well on JGC's competence and demonstrates bountiful investor confidence. Such accidents happen when you don't pay the necessary attention to your risk stability and VaR diagram. Financial sector is one of the most regulated out there...you can't go around making claims without something solid to back them up. That this still happens is only proof that regulators are weak and slow, not that your marketing is honest and proper. Nowhere does it say that those 'investor's capital' figures are seriously inflated. This is simply inadmissible. There's no excuse for such a thing especially that it's been going on for more than a year. Ignacio will come and say 'kindly notice we're working on Darwinex reloaded which will be out soon' and all that polite, wooden language, but it's no excuse. I perfectly understand that you disliked that contest aum has been presented as investor's capital. This is what I call a necessary evil. The important thing is that it is working, it started a virtuous circle. I am sorry but I am not going to waste my time reading this debate.... for me it is finished. If I had invested 500.000 euros in my Darwin, I would say directly because it would be the biggest way of marketing. I'm sorry, gentleman, but JGC has almost 400 investors, and all the money is from the investors, except 80.000 from darwinia. 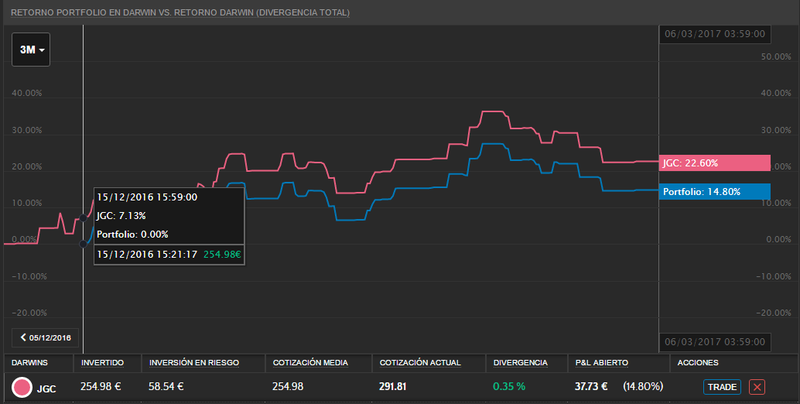 I don´t know why so many people chase my Darwin, because there are a lot of traders much better than me, and others darwins with better returns.... I like to think, because they have thought that I am a provider whom they can trust. I have shown my discipline, and the only thing that I can promise is that this discipline will continue until the end. I don`t know if the profits will continue, nobody can, but the discipline will. Finishing I have to say one thing, I am a happy and positive person with a lot of self-confidence. I am a very succesful proffesional, and I have always been successful in everything that I have dedicated from child. Do you know the secret? It is to avoid being sorrounded with negative and toxic people.... because this is contagious. Then this is my last comment in this post. What gives you the right to call names people who ask legitimate questions? Getting lucky with JGC so far doesn't mean you're smarter. You keep criticizing Darwinex because they hide losses and losers. When you go to the bank to invest in some funds, do they show you winning funds or losing funds? The only way to keep trace of accountability would be to keep all Darwins online for consultation even after being closed and put more emphasis on tracking multiple accounts from a single user. Until then, there will be always a way to handpick only the charming track records out of a basket of ones. In this thread, numerous live portofolios are shown coming from multiple accounts. The case is particular since it's coming from an array of people ? and used as fact to elaborate an experience. Eventually, nobody could prove there aren't more behind, undercovered. Also, when/if multiple portofolios can be arranged from a single account, tracability could be tied to always posting the user source when a discussion arises.